By Kori ~ March 4th, 2009. March is Washington Wine Month. Wanting to get a head start on celebrating the fabulous wines that Washington State produces, we decided to feature Washington Cabernet Sauvignon in our wine tasting dinner last Friday night. And what a tasting it was! 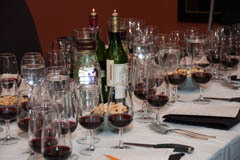 We enjoyed six outstanding Cabs which all paired perfectly with Momâ€™s dinner of tomato soup with basil garnish, mixed green salad with feta, prime rib, onion and parsley new potatoes, sautÃ©ed snow peas and broccoli, and German chocolate dessert. 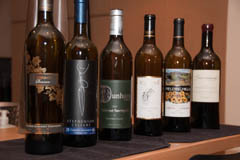 Most importantly, on top of being high quality wines, all six give you the most bang for your buck as well. Given that the majority of Cabs of this quality level from California would most likely set you back over $100, Washington wines are perfectly positioned to thrive in the current economy. This is excellent news for the Washington wine industry as well as excellent news for you and me as wine consumers. While we had tasted all six of these wines before, we had not previously put them up against each other in a blind tasting. Regular Wine Peeps readers know that we have long been fans of Columbia Crest. As the largest producer in the state, Columbia Crest continues to pump out great wines at great prices. Well-known for their Grand Estates and Two Vines lines, it is their Reserve line that puts them in the league with the premiere producers in the state. With that said, I must admit that I was a bit surprised when we pulled off the sacks and discovered that the 2005 Columbia Crest Reserve Cabernet Sauvignon was the consensus favorite. It just goes to show that you canâ€™t judge a book by its coverâ€¦or a wine by its label. The Columbia Crest Reserve was followed closely by the 2006 Stephenson and the 2004 Dunham â€œXâ€. And, in turn, those top three were followed closely by the 2005 Watermill, the 2005 Fielding Hills, and the 2005 Boudreaux. Anyone looking to try more Washington wines this month or just looking for high quality, great value Cabernet Sauvignon should consider giving any of these six a try. They are all great examples of the consistent quality coming out of Washington these days. 2005 Columbia Crest Reserve Cabernet Sauvignon (Columbia Valley, Washington): Nose is a bit tight at first. Opens up with aromas and flavors of black fruits, green pepper, and cocoa. Medium-bodied with medium tannins. Well-balanced with a long finish. 2006 Stephenson Cellars Cabernet Sauvignon (Washington State): Deep red. Aromas a bit tight at first. Very flavorful with blackberry, black currant, and pepper notes. Medium to full-bodied and crisp with high, drying tannins. Overall very smooth with a long finish. 2004 Dunham Cellars â€œXâ€ Cabernet Sauvignon (Columbia Valley, Washington): Very aromatic with aromas of grape fruit roll-up and pickles coming through on the nose. Plums make their appearance on the palate. Smooth with medium body and medium, soft tannins. 2005 Watermill Cabernet Sauvignon (Columbia Valley, Washington/Oregon): Deep red with aromas of rubber tires and smoke. Flavors of black cherry and pepper. Medium-bodied and lively with a long finish. 2005 Fielding Hills Cabernet Sauvignon (Wahluke Slope, Washington): Quite a bit of oak and buttered popcorn aromas at first. Much better on the palate with black fruit flavors prominent. Medium-bodied, medium tannins, and a long finish. 2005 Boudreaux Cellars Cabernet Sauvignon (Washington State): Raisins and blackberry come through on the nose. Not very fruit-forward on the palate. A bit oaky. Medium to full-bodied with high, very drying tannins.